Palm Beach County Sheriff’s Office, the Chiefs of Police in Palm Beach County, and Crime Stoppers of Palm Beach County, Inc. have partnered together to implement the Bad Guys/Bad Guns Program, which provides a reward for every confidential tip made to Crime Stoppers of Palm Beach County, Inc. that leads to an arrest, and the recovery of a gun in Palm Beach County. Not a gun buy-back program (which we view as largely ineffective in removing guns from the hands of criminals who use them to commit crimes). 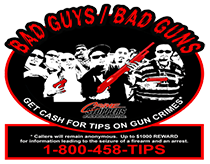 Focuses on paying for INFORMATION (leading to the seizure of guns used in a crime and/or the arrest of criminals).